40m³ Cold Rooms for cold storage (3°C) of dairy products and vegetables. Tramezzino.it, Via Guglielmo Guintellino n°26, 20143 Milano, Italy. 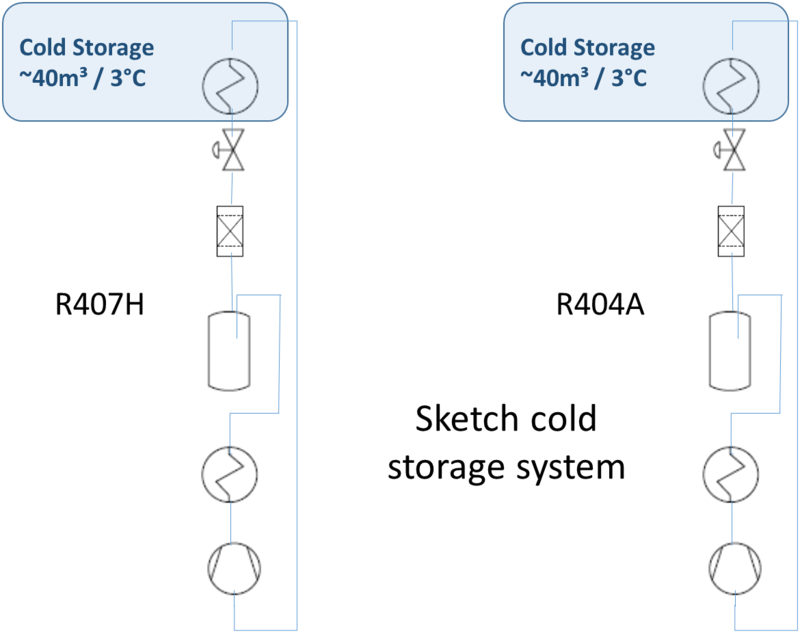 Two cold rooms were investigated, each with an independent cooling system. Both cold rooms are of same size and are equipped with identical prefabricated condensing unit, evaporator and TXV expansion devices. Both cold rooms are running at comparable temperatures. 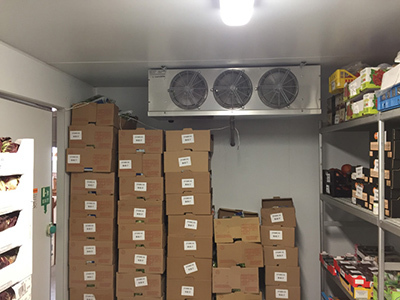 One cold room is utilized for storage of dairy products, and the other for storage of fruits and vegetables. Both cold rooms are located side by side in an open, 10m high hall. Hence, both systems are operating under the same ambient conditions. 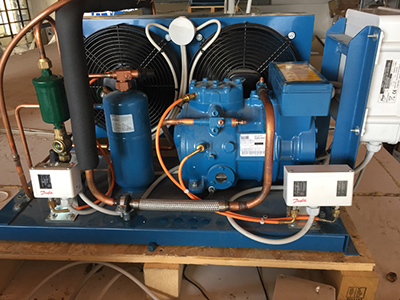 The condensing units, consisting of the compressor, condenser and liquid receiver, are installed directly on top of the cold chambers. No special measures were taken to adopt the condensing unit, originally designed for R-404A, to R-407H. The R-407H system was filled to 90% of the R-404A nameplate capacity. The measured compressor power consumption for the R-407H retrofitted cold room was 1.6kW vs. 1.4kW of the R-404A system. From the measured pressures (LP + HP) and the measured temperatures entering and leaving the compressor, the enthalpies were calculated. The COPs were then calculated from the enthalpy differences and the measured power consumption. The calculated COP of R-407H system was 42% higher than that of the R-404A system. The discharge temperatures were increased moderately from 66.6°C (R-404A) to 78.6°C (R-407H).